No driver wants to have their headlights die at night or at during times when they need them the most. That’s why it’s good to know the longevity of your headlights, how to take care of them, and tips for seeing well at night. Here are some facts about your headlights and for seeing well as a driver! Did you know that headlights are different depending on the country you are in? Headlights are designed to hit the street at a certain angle to provide enough visibility to drive without blinding drivers who are driving in the opposite direction. Because roads and traffic laws are different in America compared to European countries (and others), you have to know the right type of headlights to get when replacing them. Depending on where you drive your vehicle, the headlights will be calibrated to cars that are meant to drive on the left side or the right side of the road. The direction of the light will be different in those headlights in Europe, as they drive on the left side of the road. American cars will be calibrated for cars that drive on the right side of the road, slightly diverting the lights from hitting oncoming vehicles that are driving on your left. If you buy your car from another company, make sure the local auto shop adjusts your headlights for you so the light hits the road correctly. The first light to be used for night driving was actually kerosene (oil) lanterns until the invention of the light bulb. 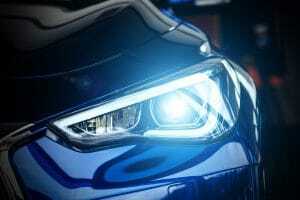 Headlights now come in various forms of light that include halogen, xenon, HID (High-Intensity Discharge), LED and even laser light. The type you choose is what will determine the color of your headlights and how bright they are on the road. The halogen light bulb was one of the first lights used in cars when they were first manufactured, and it remains the most popular. That may change in coming years because of the longer-lasting lights that have been created today. High-beams use about 70 watts of energy, while low-beams will use 60 or less. HID headlights give off a blue tint, which can be confused for blue light bulbs. Installing blue lights under your car may be illegal in certain areas, whereas HID headlights are not illegal. They are different from blue light bulbs. The average head light will last anywhere between 450 and 1,000 hours of use. It depends on the type of bulb, wattage, and vehicle. One of the biggest problems with winter is visibility. It’s hard to see through snow, ice and the windshield constantly fogging up. When you head out on a snowy day, you want to take a few minutes to defrost your car so you have good visibility on the road. If you’re in a hurry, crank up your defrost function as soon as you are in the car and have it set to heat. It’s always good to keep a scraper in your house with you so that the car can be scraped prior to getting inside. Plus, it can be cold enough in some areas of the U.S. that the car will be frozen shut. Always scrape off snow and ice from both windshields and all the windows of a car. You need that 360 view to see oncoming cars and to avoid a crash. 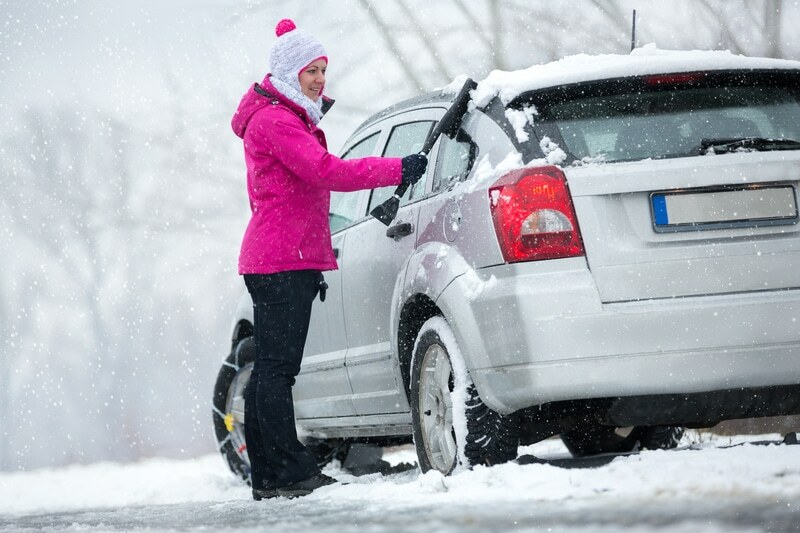 Never use a spatula, card or other object besides a scraper to scrape your car, as you can cause damage. If you are struggling with the defrost function of your car or with frozen doors, try a deicing solution from an auto store. If you make the at-home version, you mix ⅓ parts water with 2/3rds part rubbing alcohol. Deicers can melt ice in seconds and won’t freeze. It’s always a good tip to scrape snow off of the front and back hood of your vehicle, as well as on top of the vehicle. If not, you may have snow constantly flying up onto the windshields that give you poor visibility on the road. Keep your windshield wiper fluid filled before winter hits so you have plenty of fluid to remove ice and salt from the roads, which can cloud your visibility very quickly. Want to be as safe as you can be on the road? It only takes a bit of planning and smart decisions. Keep clutter out of your car so all points of visibility are free and unblocked. 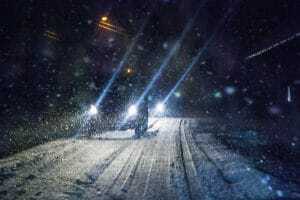 Plan your driving trips ahead of time, especially in the winter and know what type of weather you should expect. Avoid peak times when traffic will be especially busy or take alternate routes when you can. Keep snow and ice removal items both in the car and on your person so you can get into your car. Invest in a small emergency pack that you can keep in your car in case you get stuck with a flat tire, in a traffic jam, in the snow or have another emergency. As always, make sure you keep up on your vehicle maintenance checks so you don’t have unexpected breakdowns while driving. All of these tips are ones that can help you get started on being safer on the road. If you have more questions about replacing headlights, seeing better on the road or car maintenance, call Scott’s Fort Collins today at (970) 682-4202!